Another day, another tallest LEGO tower record. The most recent record fell last month to hundreds of youth builders in Vienna, who were celebrating the "100 Years of Friends of Children" festival. The tower was built in just four days and broke the Windsor tower's record by a brick-busting seven inches. 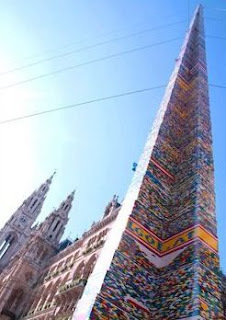 The final height was just a few LEGOs taller than 96 and a half feet and consisted of more than 460,000 pieces.